I had the pleasure of spending another magical weekend at Turtle Island Preserve. It’s becoming my favorite destination for mommy-run-away-weekend (I spent a weekend there before learning how to tan deer hides). 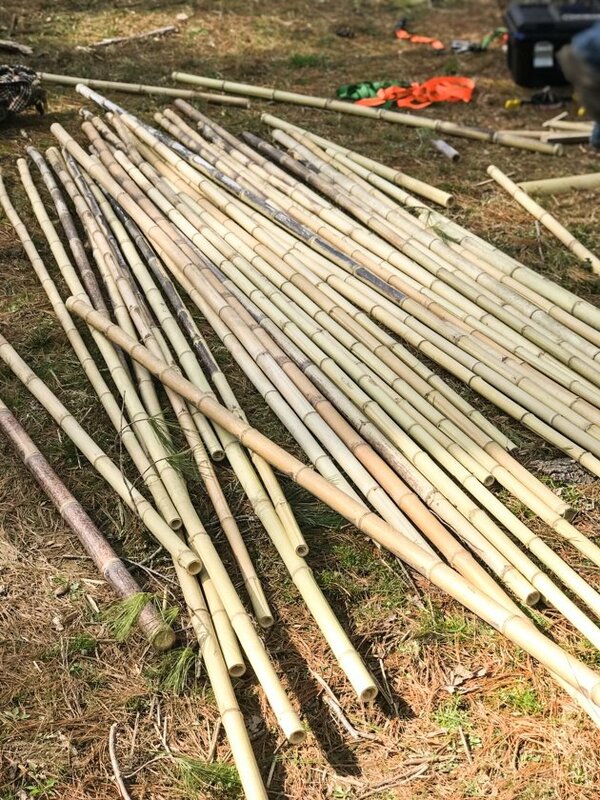 This time, I went to volunteer for the weekend and ended up receiving a privet bamboo workshop! 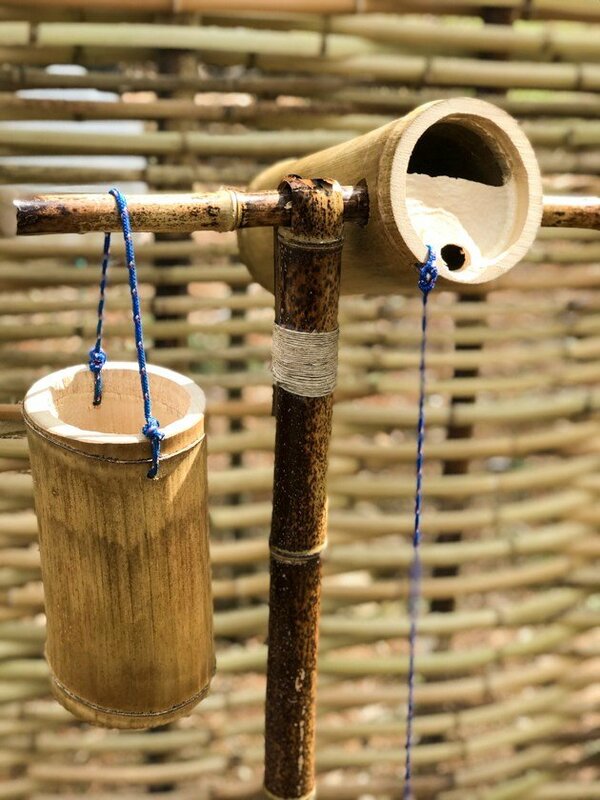 How that happened, I am still not sure, but the moment I’d heard that a bamboo expert was on camp and he was going to weave a hand washing station entirely from bamboo, I was right there by his side. You know I was. Camera in hand and approximately 2 million questions. I didn’t really care about the hand washing thing to tell you the truth. I think the whole hand washing ordeal is completely overrated, but the weaving part? Now that was something that caught my attention. 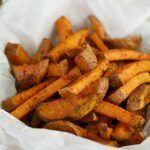 Basket making is a hobby of mine and my ultimate goal is to harvest my basket making supplies from nature. 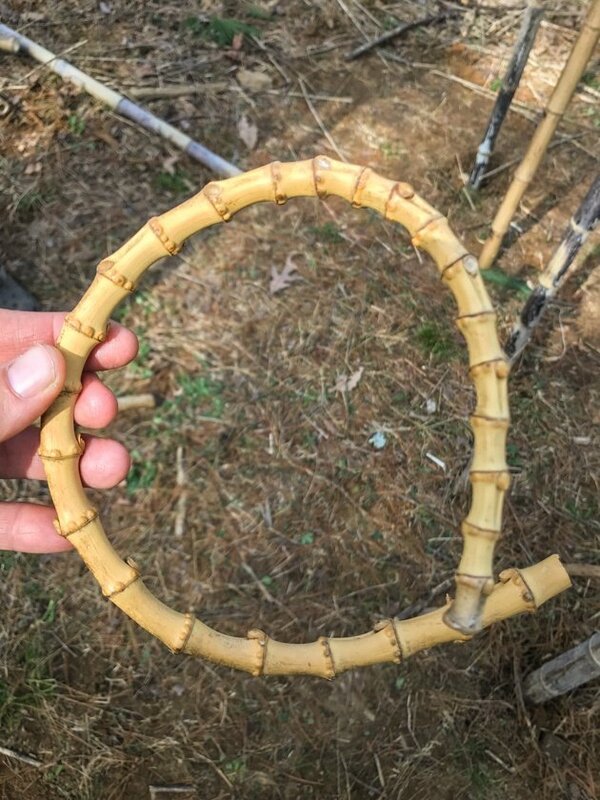 We have a ton of honeysuckle and kudzu here in central NC, and I am working on learning how to harvest and use those, but I knew that bamboo was another plant I could use so I wanted to take advantage of the opportunity and learn more. 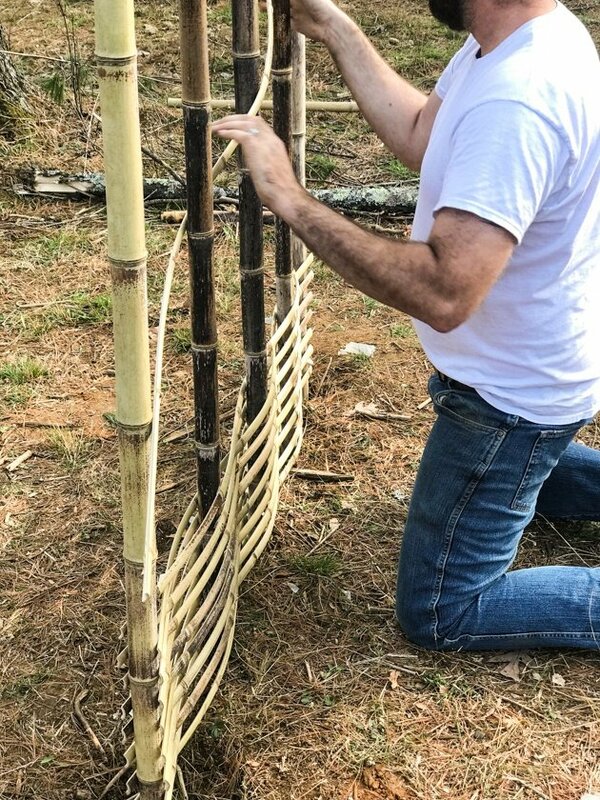 I also know that the same weaving technique can be used for outdoor projects like fencing and trellising and such… In fact, I’ve already experimented a bit in the past with a bamboo trellis, but I needed to learn how to use it better. What I didn’t know was just how amazing this plant is! 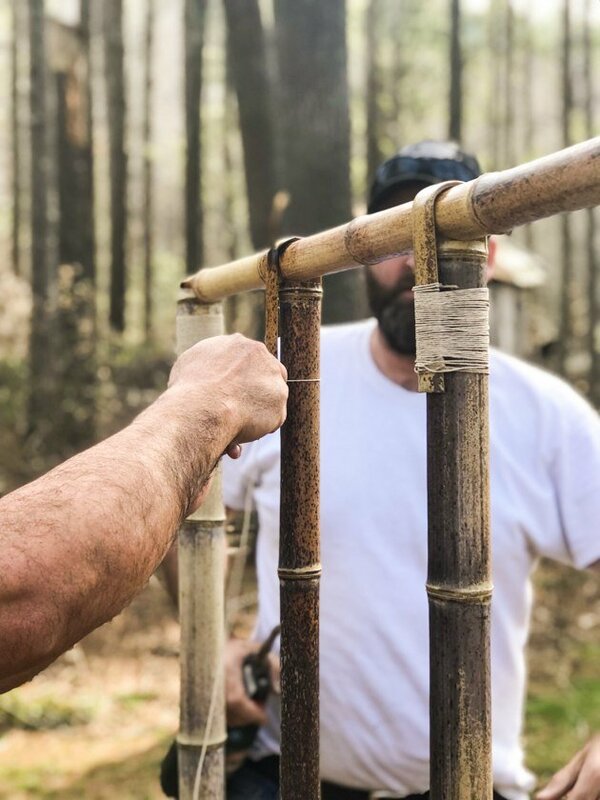 This post will be too long if we start getting into all the different bamboo varieties and how to grow… I am now thinking about planting some bamboo on my land so I might write a post about this later, but for now we’ll just go over the basics and, hopefully, it will inspire you to learn more about bamboo. 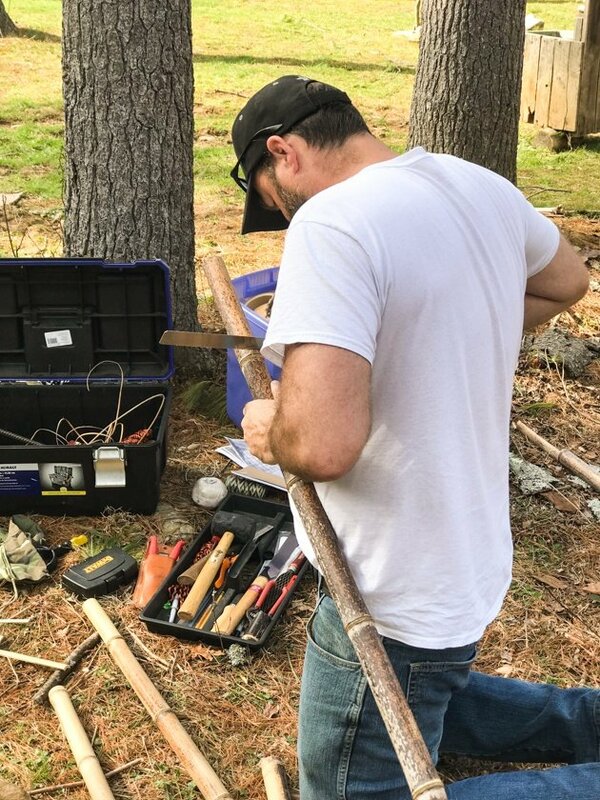 ** Turtle Island is a primitive camp devoted to teaching primitive skills, off-grid simple living, survival, natural building and so much more. Check out their workshops and events or how you can volunteer and support them on their website here. Bamboo is an evergreen grass. Bamboo is hollow and rarely flowers. The grove is connected underground by a web of rhizomes that give it amazing strength. The main difference between the underground part and the above ground part is that the underground rhizome is not hollow. New plants come up every spring from the rhizome, they poke from the ground kinda like asparagus and they grow very fast. In fact, bamboo is the fastest growing plant in the world! 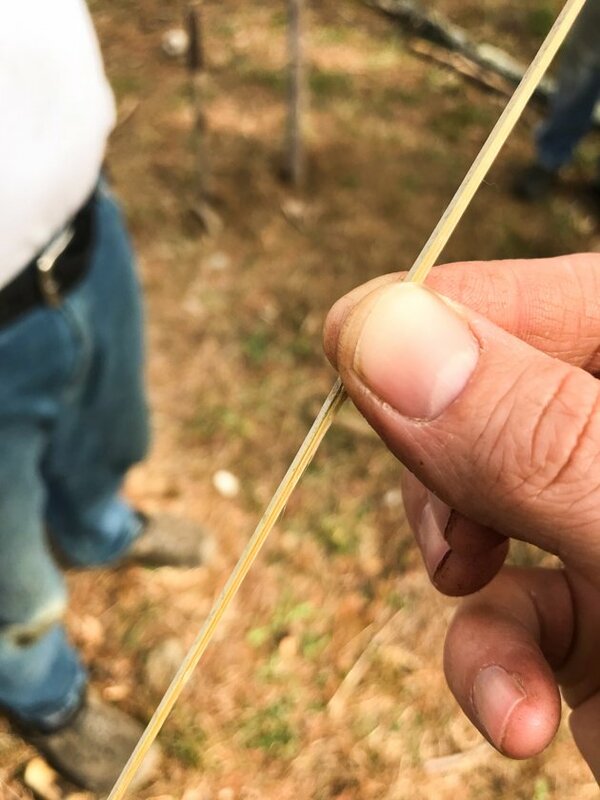 A bamboo cane will grow to its full size in 60 days. Some varieties can grow 47.5’’ in 24 hours! After those 60 days, it will not change its size anymore. 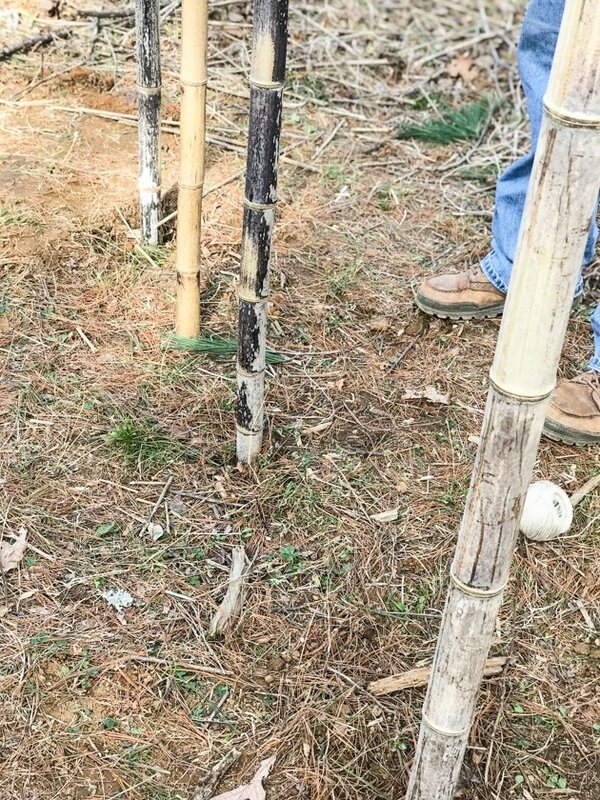 Instead, the bamboo will keep hardening and growing and dropping leaves. 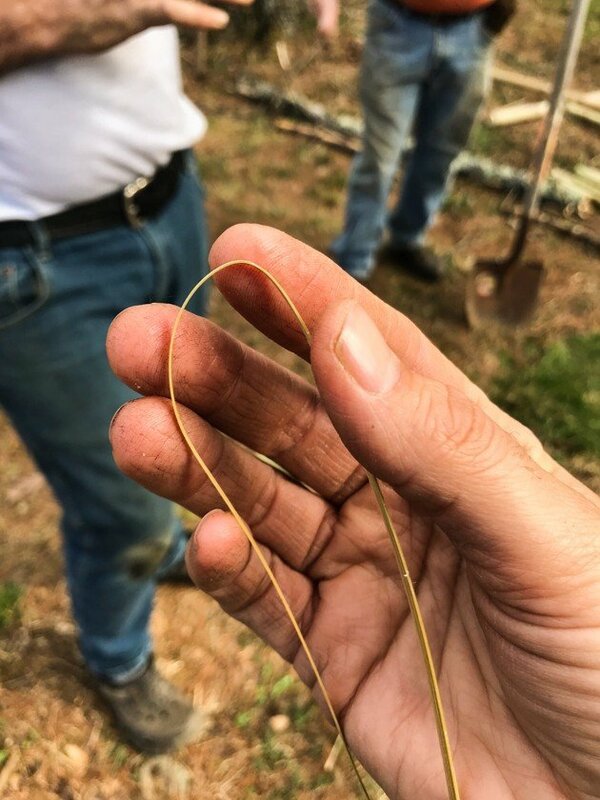 Part of correct grove management is harvesting bamboo at the five-year mark. Bamboo grows everywhere, and as I hear, is not at all hard to grow. Most varieties don’t like a severe cold. Most bamboo varieties prefer wet and warm climates, however, there are some varieties that will grow in the mountains successfully. Aaron, who you’ll see below building the hand washing station, was an intern of Keiji., a bamboo farmer. Keiji And his wife created a magnificent 6-acre bamboo forest (which is now on my Places-to-Visit list) in the mountains of NC. Bamboo might be the most useful plant in the world. 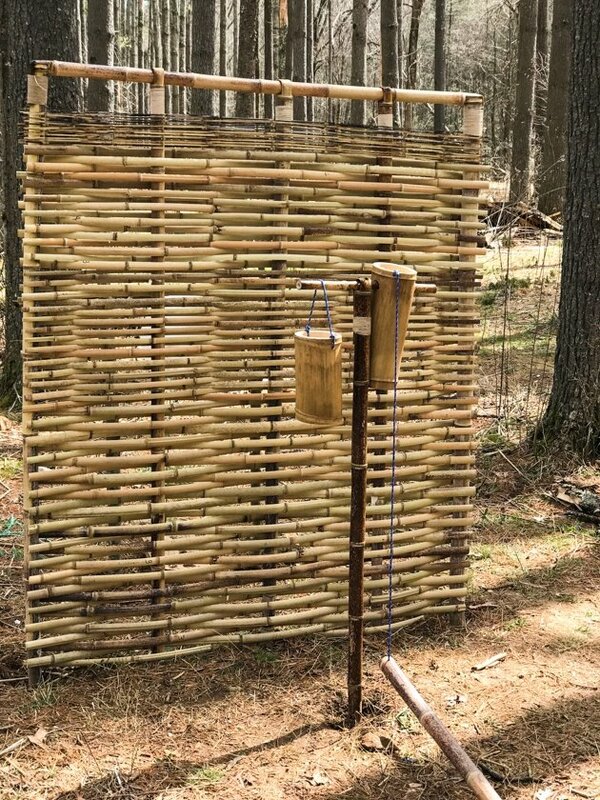 While building the handwashing station, we tried to compare it to cannabis which is one of the most useful plants I know of… Bamboo won because of the ability to build with it. In Asia, there are houses and schools made from bamboo (You have to watch this TED!). You’ll see soon that it is a great building material. 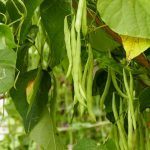 It is used outdoors in the garden for building trellises and fences and indoors it can be used to build furniture and bamboo rugs. It can be used for basket making, to make useful dishes and artistic sculptures and jewelry. It can be used to make utensils and toys and musical instruments. 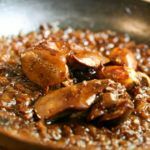 It can be made into weapons like spears and knives. Like hemp, you can make clothes from bamboo and I even heard that there are bamboo diapers! 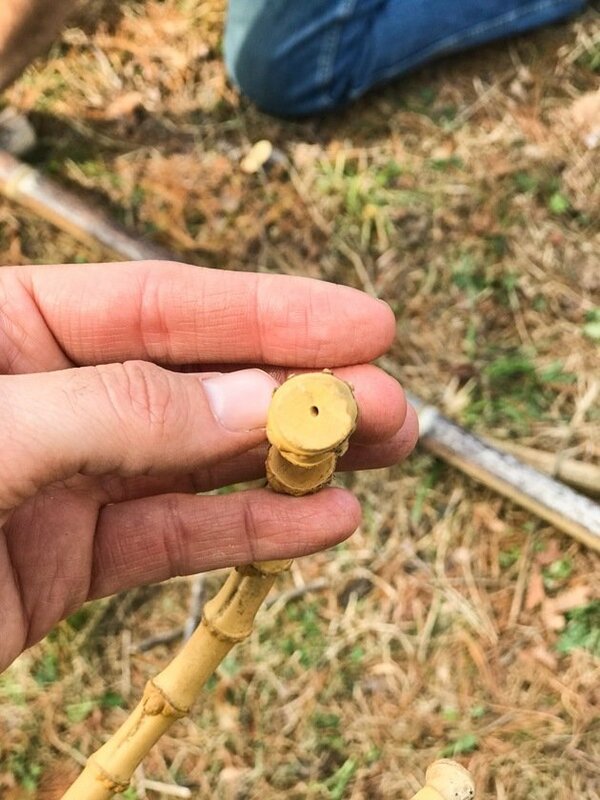 Bamboo is used for medicine, and the young shoots are harvested in the spring and used as food. 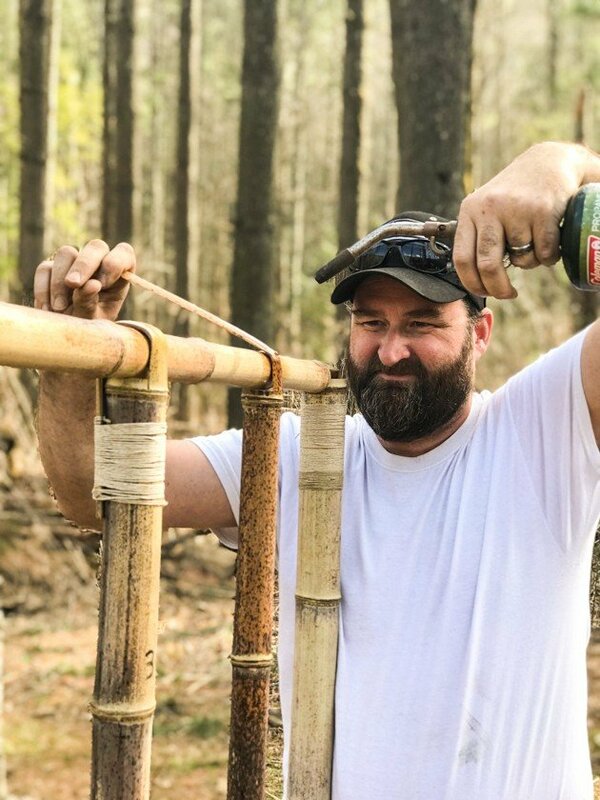 There is even bamboo beer! So you see, this plant is just a great gift from nature. 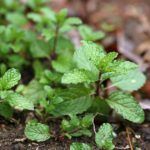 It grows so fast, can be harvested in different stages and used for just about anything. 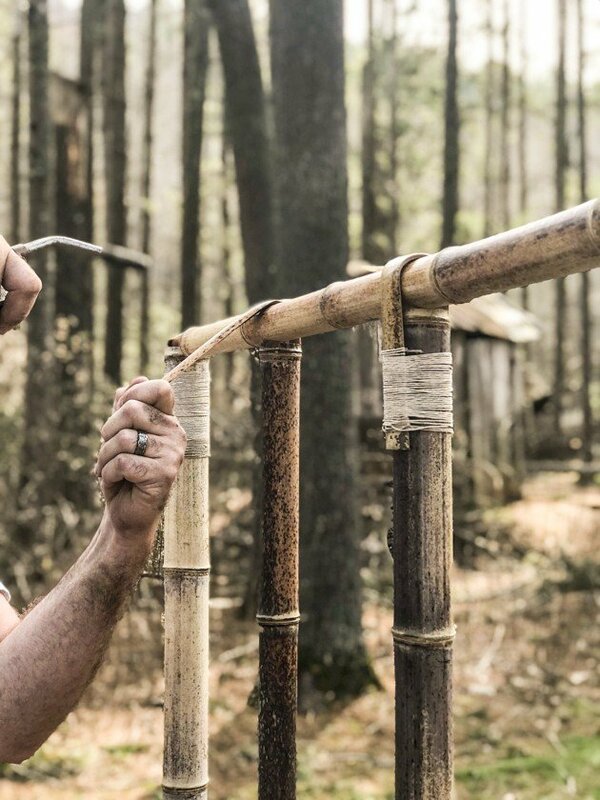 So now that we have a better idea how bamboo grows and what it is used for, let’s build something! 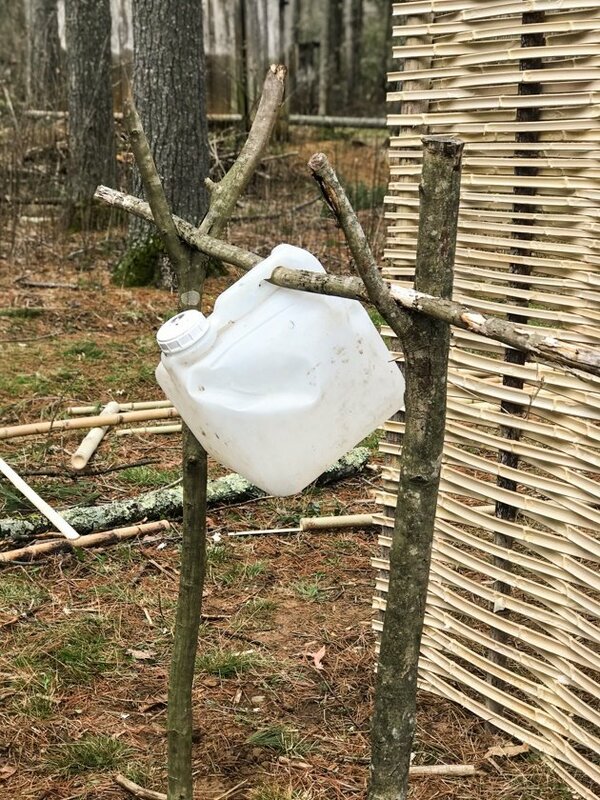 It all started from a pile of bamboo canes and the desire to eliminate a plastic jug. Previously, Turtle Island’s visitors used to use a plastic jug to wash their hands. 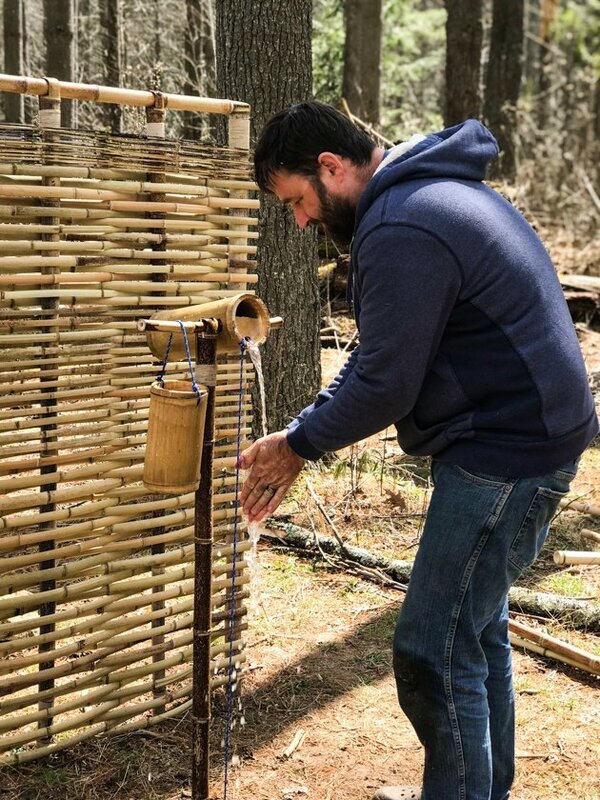 The mission was to create a comfortable and easy to use (because kids use it too) hand washing station that is a 100% built from natural materials just like everything else at Turtle Island. It needed to be useful, beautiful, and natural. 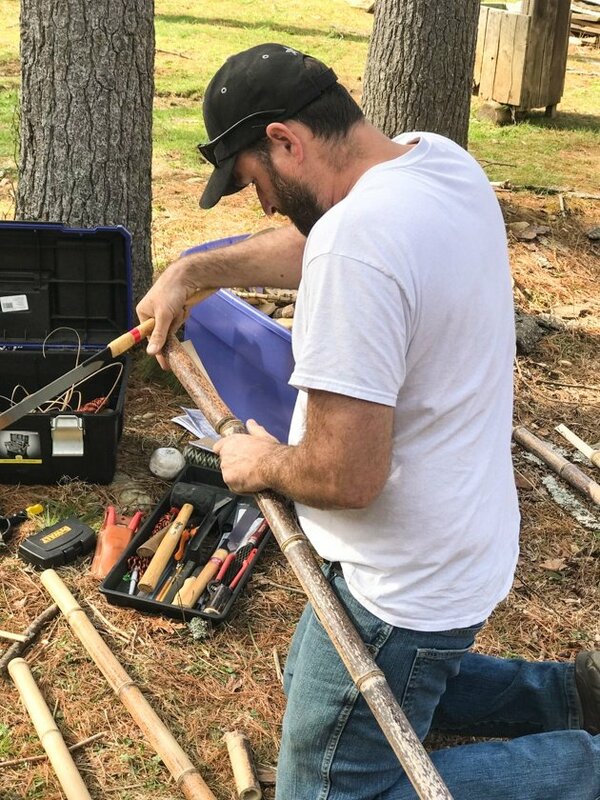 Aaron started with four canes in the ground. The outer two are stuck about one foot into the ground and the middle two just rest on the ground. This will be a nice decorative wall and the handwashing thingy will be right in front of it. 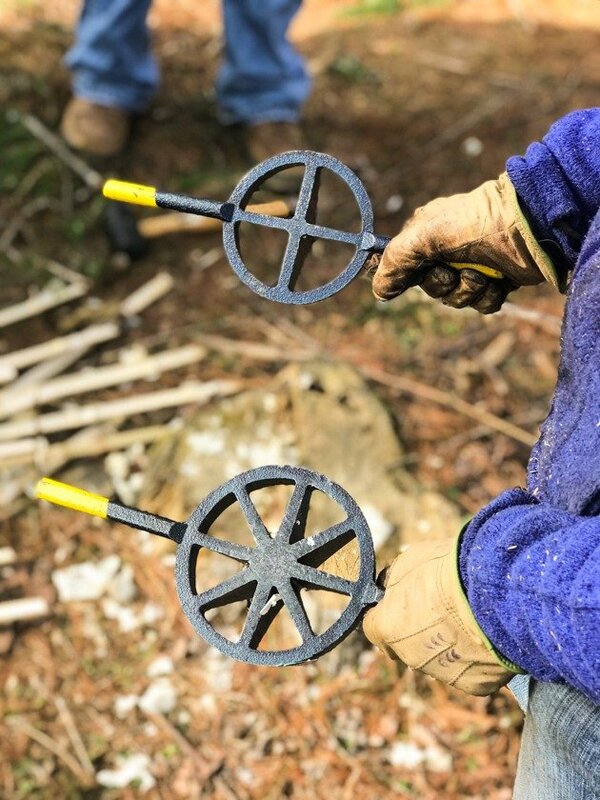 This is also how you’ll build a fence for a garden or a decorative screen/wall to hide garbage cans or something of that sort. The canes that we used here are cured. Bamboo need to go through a few months of curing before it can be used for building. 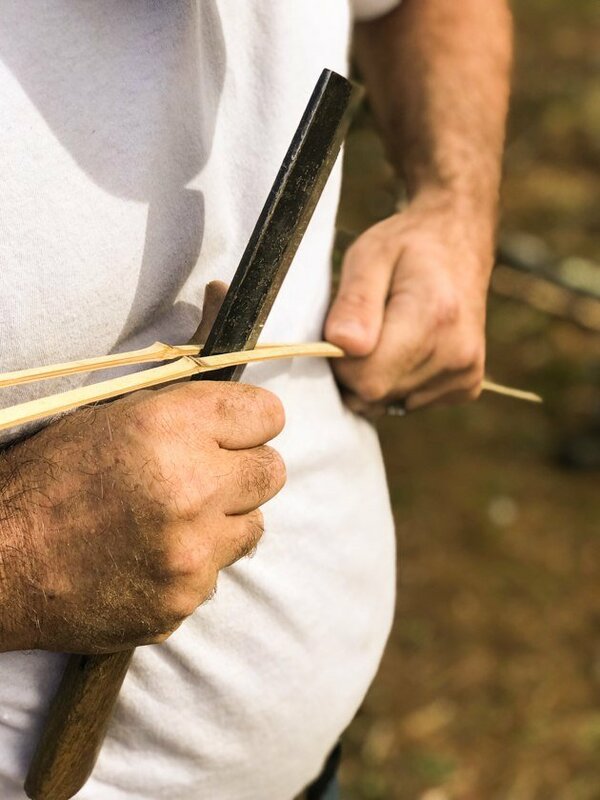 The canes are harvested when they are 5 years old and then storred in a well vantilated location away from direct sun. 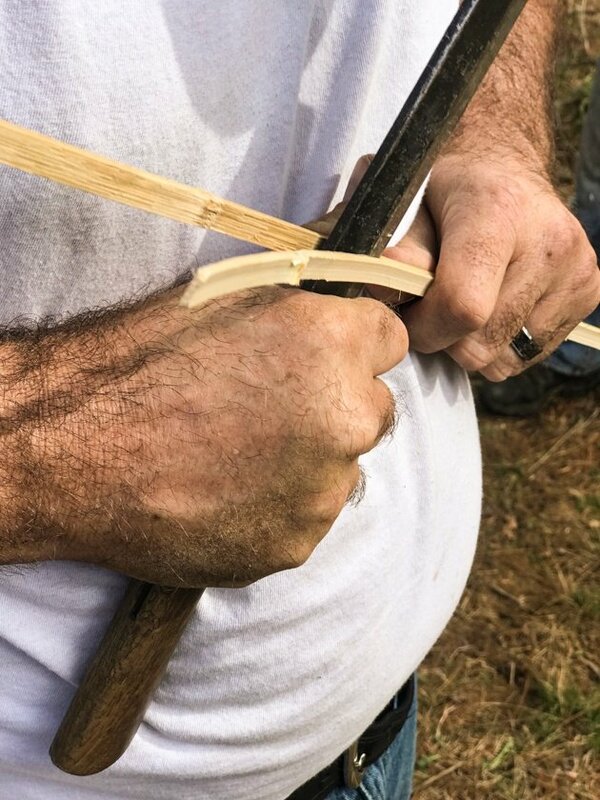 Then the remaining piece is bent over a top cane that holds everything in place. Aaron is using a small hand torch to heat the top piece and slowly bend it over the pole. He just keeps going slowly until it is completely bent. I had no clue something like that could be done! I was completely amazed! Once it is bent in place, we used a twine to artistically tie it to itself. 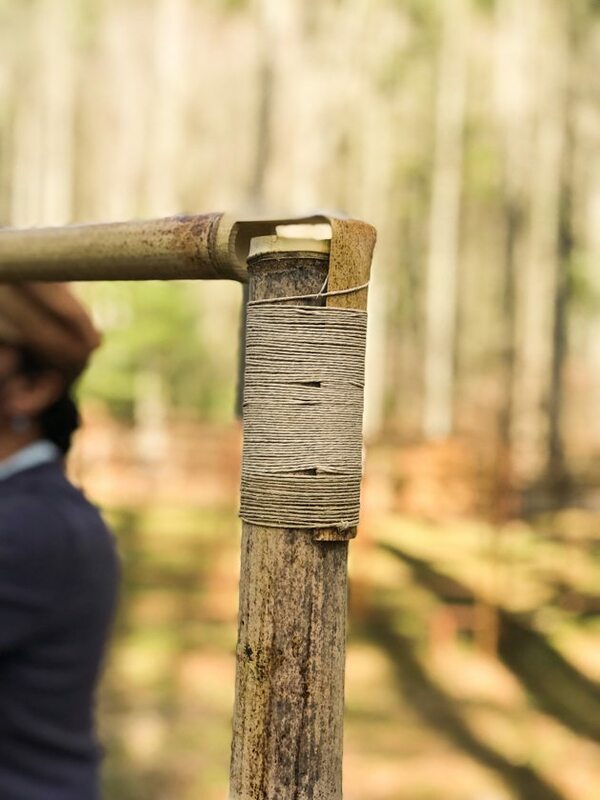 At the corners, the bamboo is bent at a 90-degree angle to hold the outside cane. 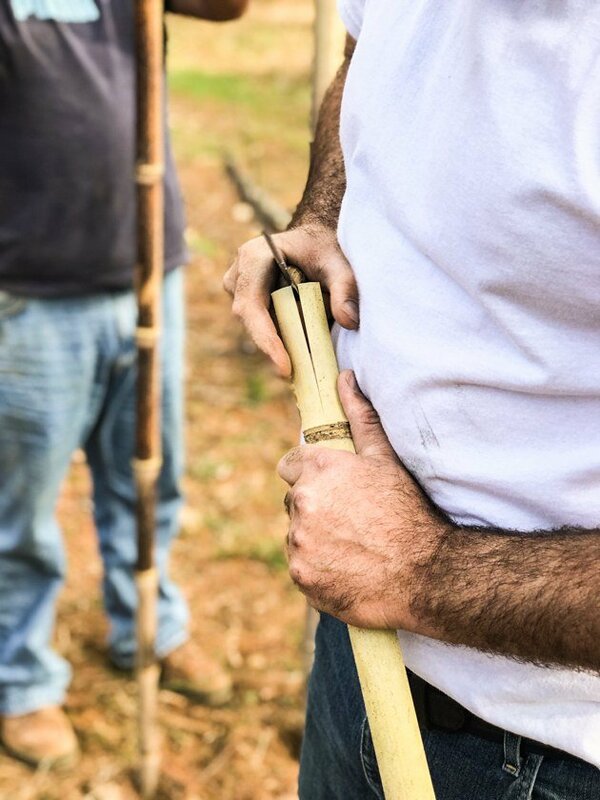 Once it is cut to length, we used those special splitters to create bamboo strips that we could use for weaving. The upper one will split a bamboo cane into four and the lower one will split a bamboo cane into eight. Here is the underside of this tool, what it is is really a knife. 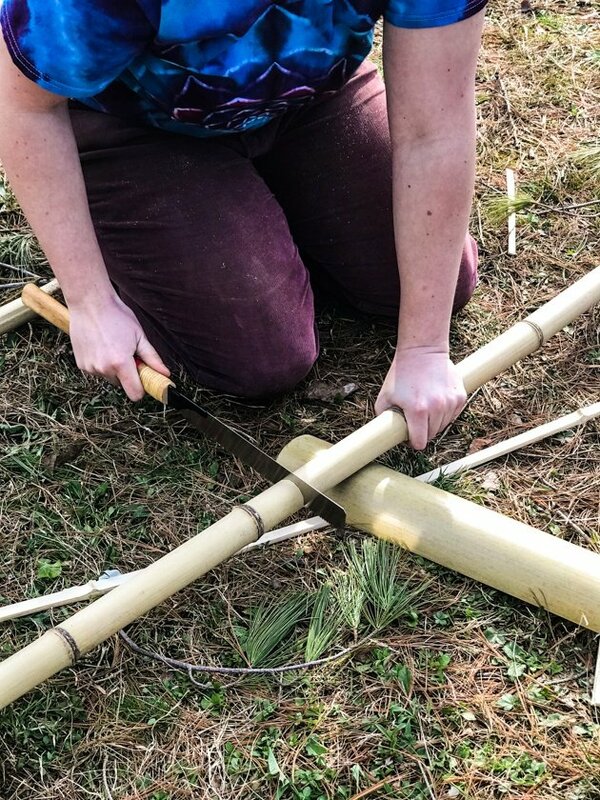 Now, once it cut into the bamboo, you hold the handles and bang the bamboo cane on the flat rock. 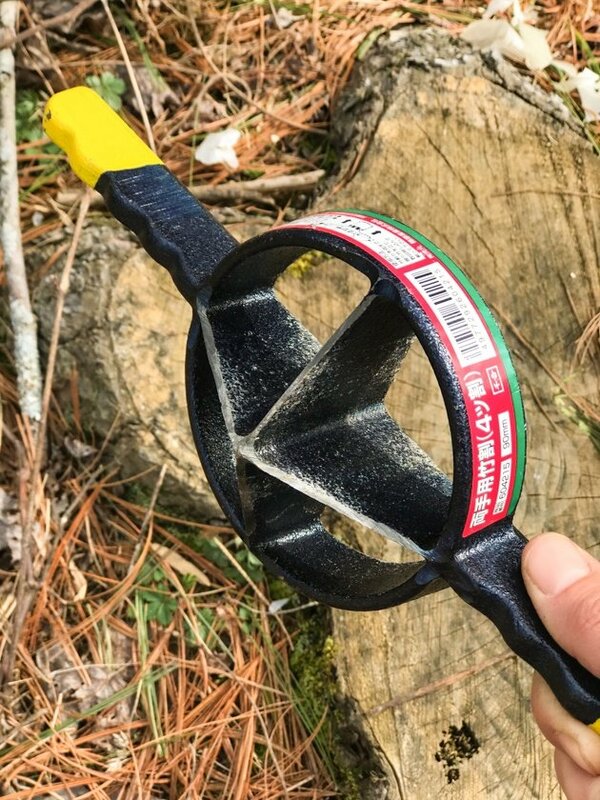 This will cause the round tool to split the bamboo. 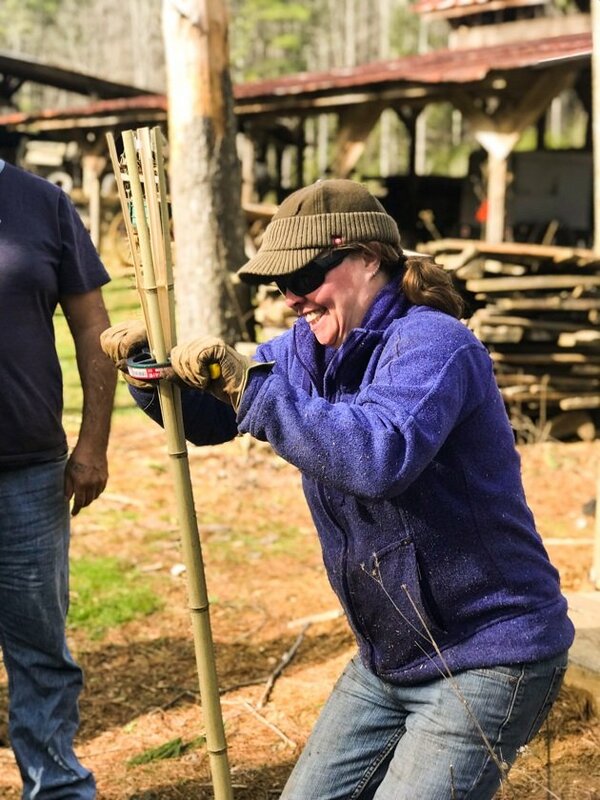 Note – you will see different people having fun with this project… We had a big bamboo party going on there! See how it just keeps going down the length of the cane? 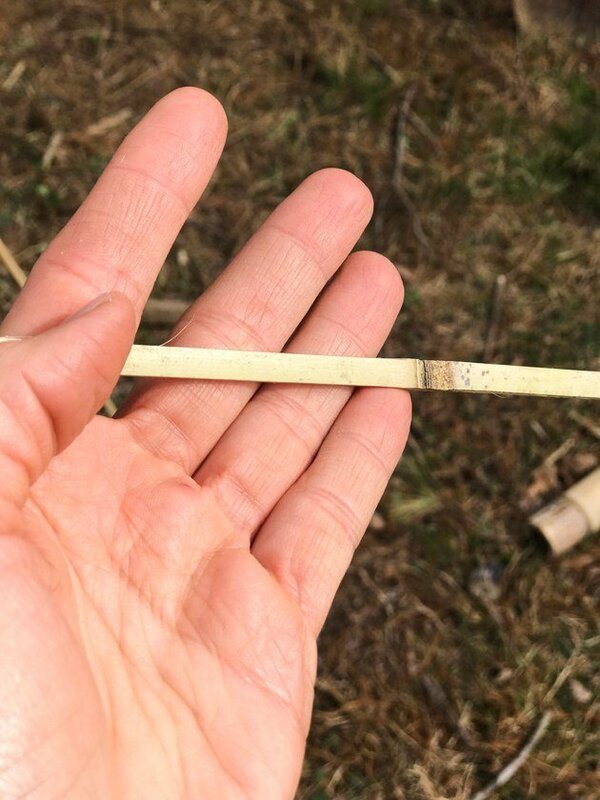 No need to bend… Once the splitter is low, you gather the pieces and bang the bamboo on the hard surface. 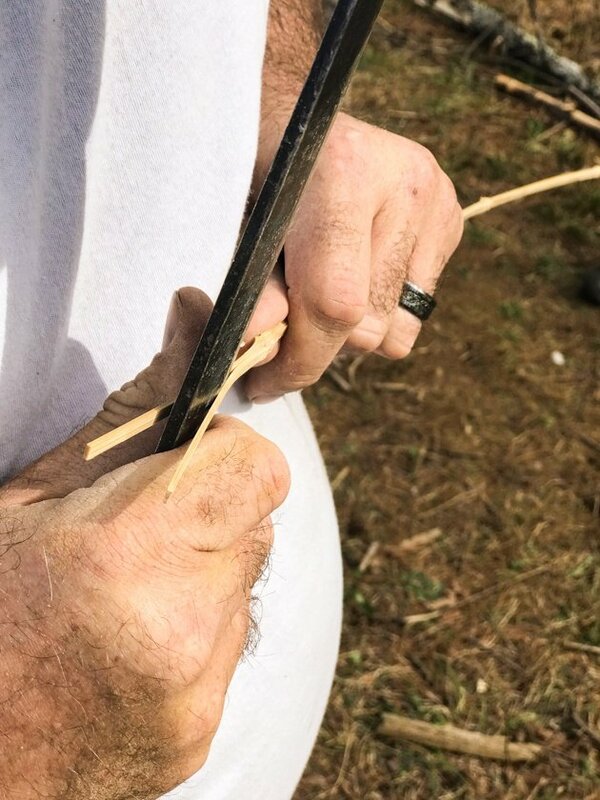 The splitter will keep on cutting until it gets all the way to the bottom of the cane. 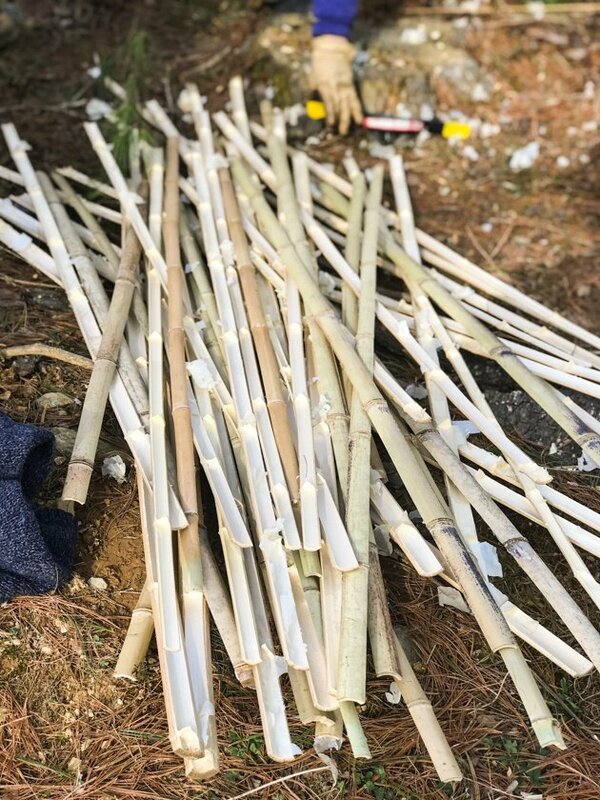 This is what we got after a little bit of work… A nice pile of split bamboo canes. Now we used those split pieces to weave between the four standing poles. He kept pushing the knife down… This knife is thick, and you can see that at this point the blade is not touching the bamboo anymore. 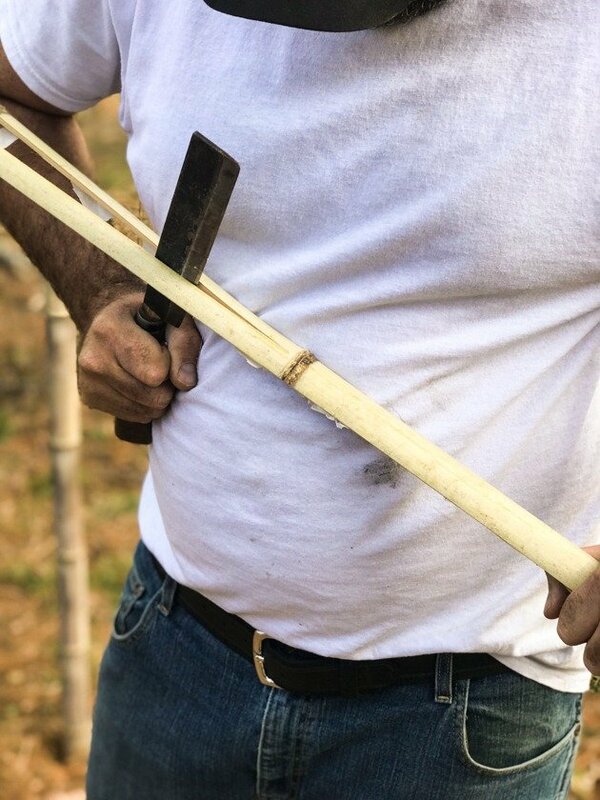 The knife is not cutting, just splitting, this is what makes the bamboo split evenly. After that first cut, the division is 50/50. Look how flexible this is! You can definitely use this tiny thing for basket making. Isn’t this amazing (the bamboo, not my hands…)?! We kept weaving up the four canes until we got to the top. 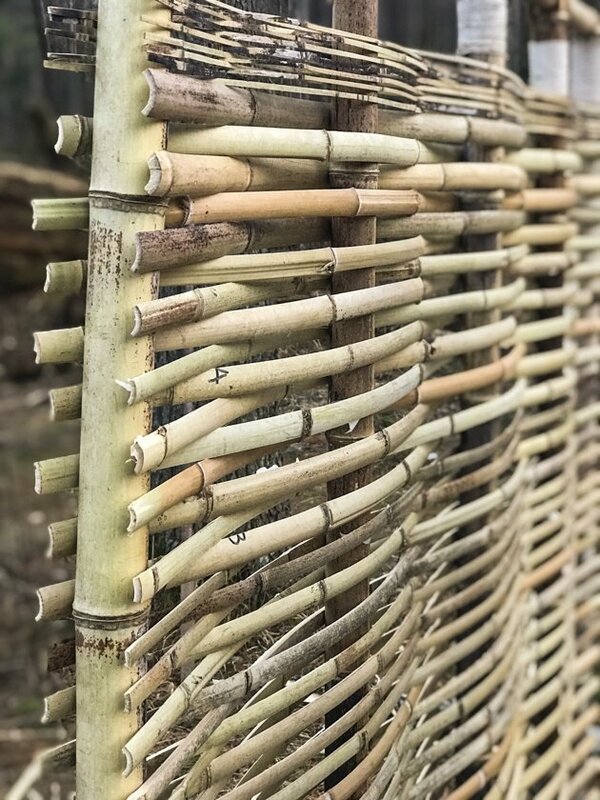 We added a decorative weave of smaller pieces at the top and left a few inches clear so people can see the twine holding the bamboo together. 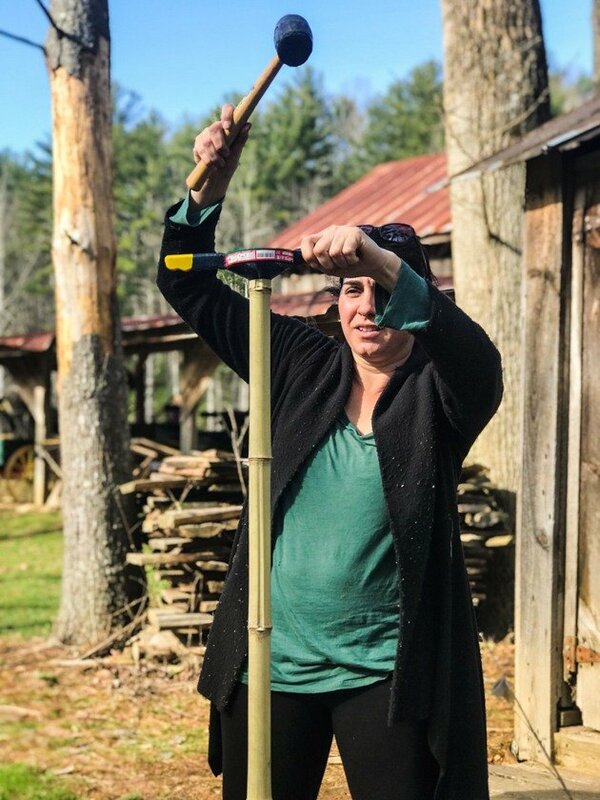 It started with this T. The cane is about a foot in the ground and the top cane will be connected to the standing cane using the same technique we used with the wall, by heating the top part, bending it over, and tieing it to itself. 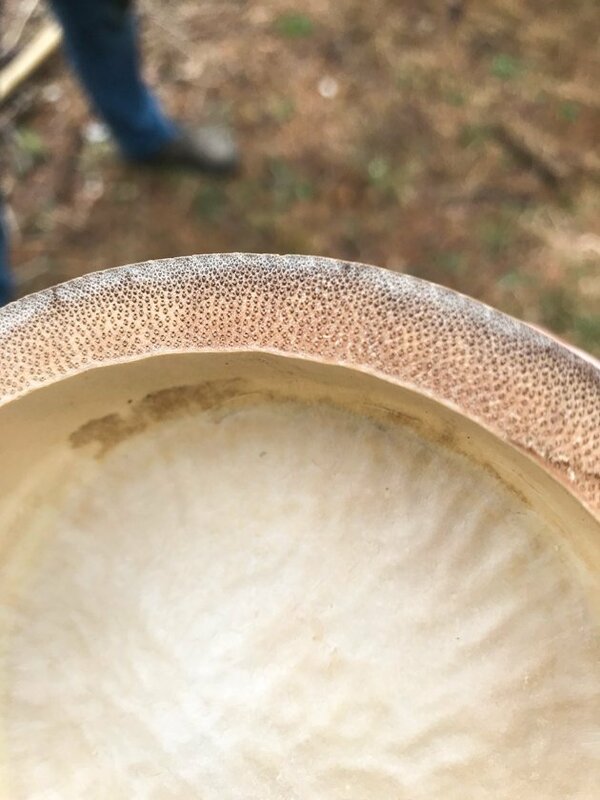 And at the top of it, he made a big opening so it’s easy to fill it with water and a smaller hole for the water to come out of. 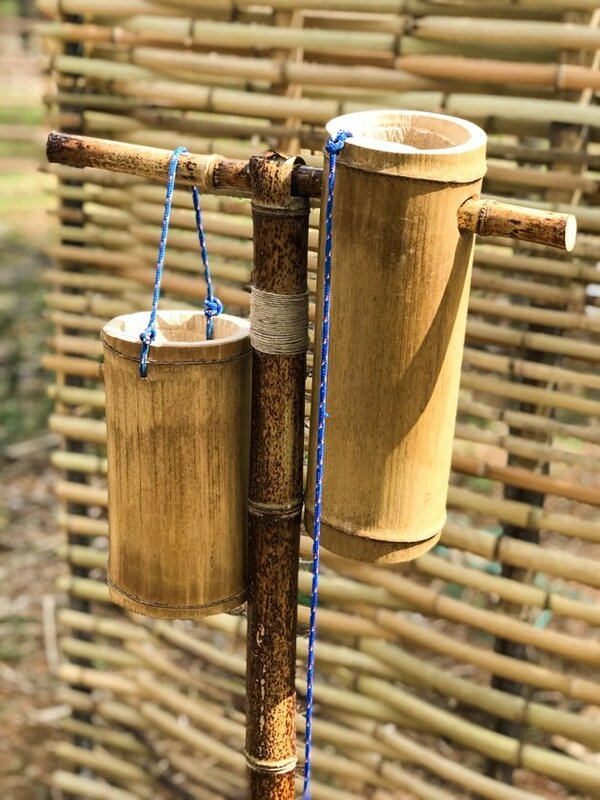 On the other side of the cane is a bamboo cup/container kinda thing that is completely open at the top, making it easy to scoop some water. You then use this cup to fill the other container. Here it is at work! Isn’t that cool! What do you think? One thing is not very clear to me yet, is how to preserve the bamboo. I know from experience that it will dry and chip (bamboo does not decompose! 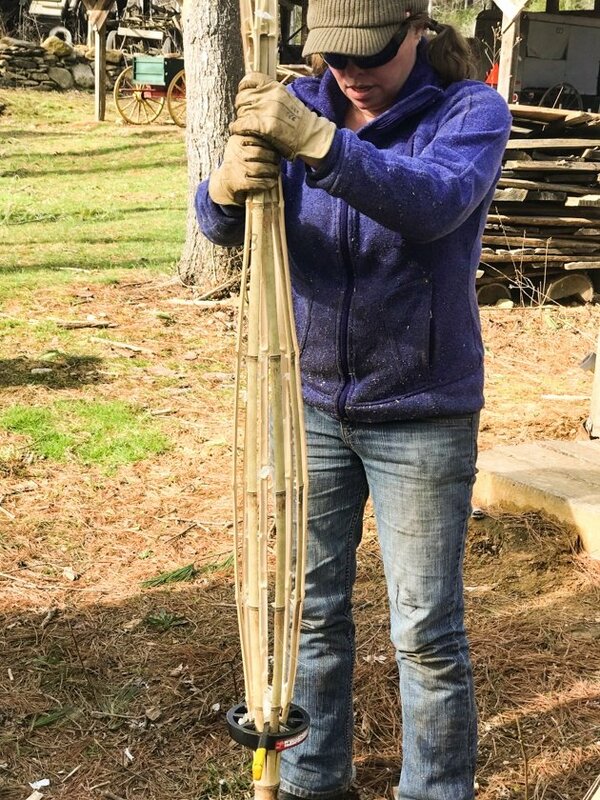 ), so there is probably a way you should paint your outdoor bamboo project to keep them in good condition longer, just as you would do with wood. I also heard that there is a borax treatment that the canes can go through before you use them for building, but didn’t research this yet. 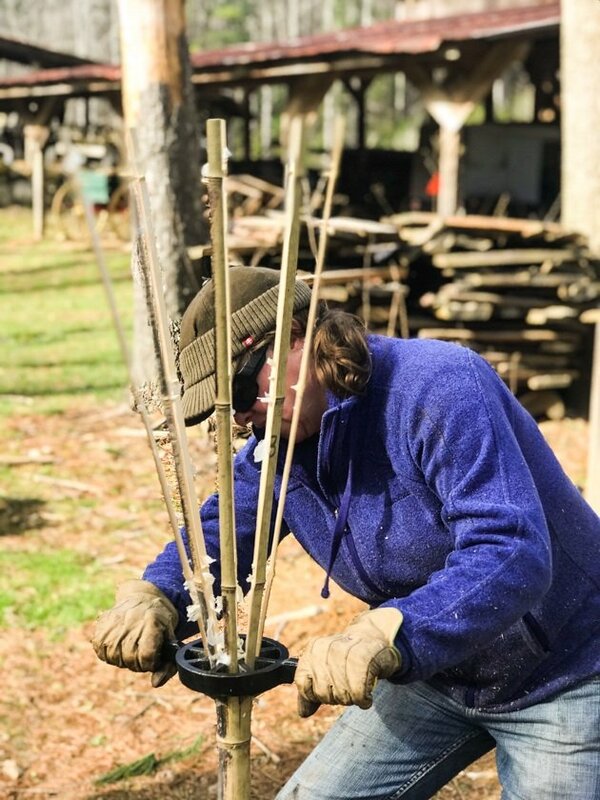 I have a feeling that this is just the beginning of my relationship with this plant… I have a lot more to learn but I am really thinking about planting some bamboo on my land. I have this area that is right by the creek and the soil stays damp over there… I have a feeling that this will be a great area for bamboo. I am afraid that it will take over the land though, so before I plant it I want to make sure I understand how to manage it. Then, I just have to add a couple of panda bears and my kids will love me forever! 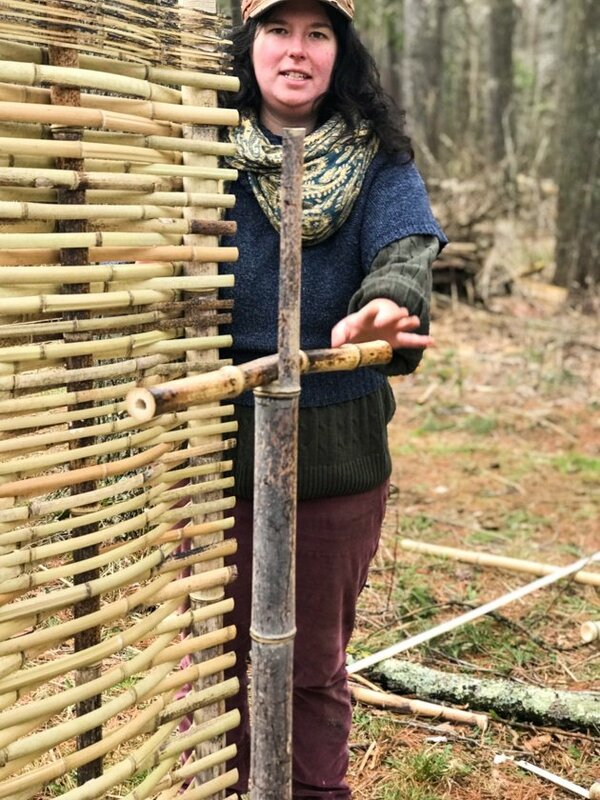 Do you have any experience building with bamboo? What do you think about this project? 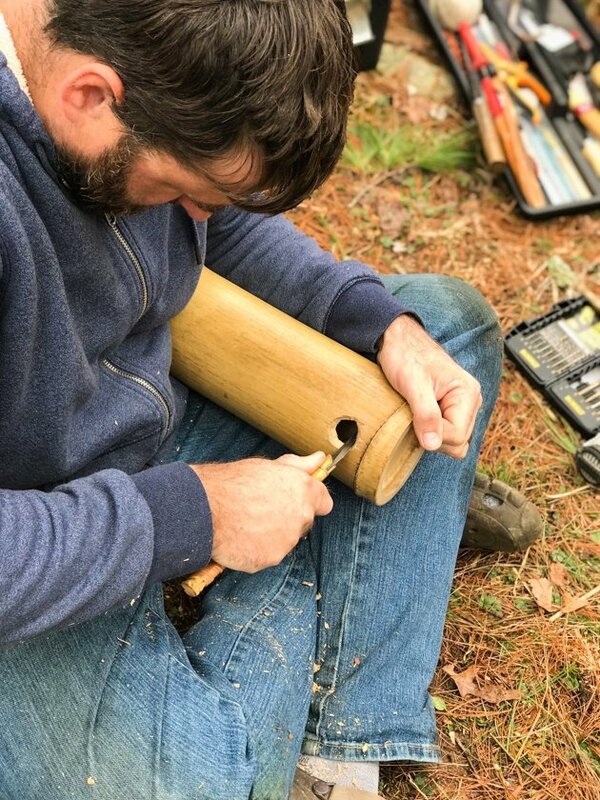 You can find Aaron’s website at Aincient Earth Bamboo. Also, Wendy, Aaron’s wife is an amazing photographer. She was using an old film camera that she had just gotten to take pictures of the project. She then developed the film in black and white. So you see, I had a privet workshop AND someone to talk photography with all at the same time! It was indeed an amazing weekend.